We’ve been hard at work on Skullgirls Mobile since our launch in May, and we have some important news for those who haven’t been following us as closely recently. In case you haven’t heard, in early 2018 Skullgirls Mobile will be transitioning from LINE to a new independent Skullgirls App in 2018! 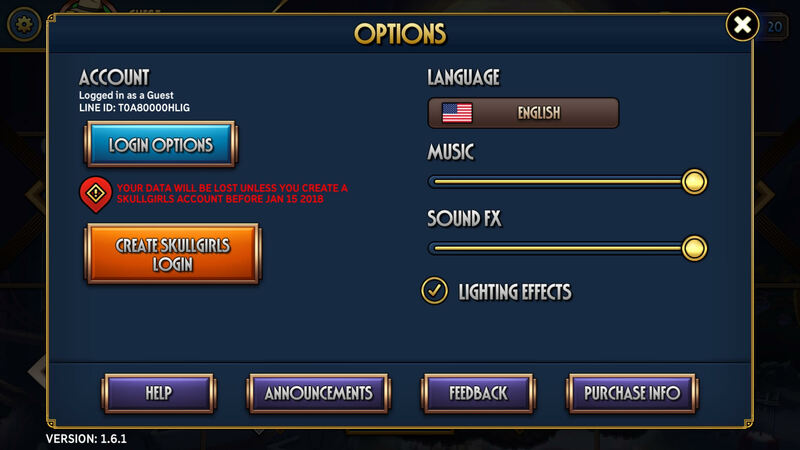 While this is exciting news, unfortunately this also means that anyone who has played Skullgirls Mobile in the past will need to create a new “Skullgirls Login” in order to migrate their save data to our new App in 2018. If you do not create a Skullgirls Login by January 15th, 2018, all of your data will be lost. The last thing we want is our older players to show up in the future to check out our new content just to find that their entire collection and all of their progress was lost! We have an FAQ (here) set up on our official forums to address all of the migration details. So how do I create a Skullgirls Login? 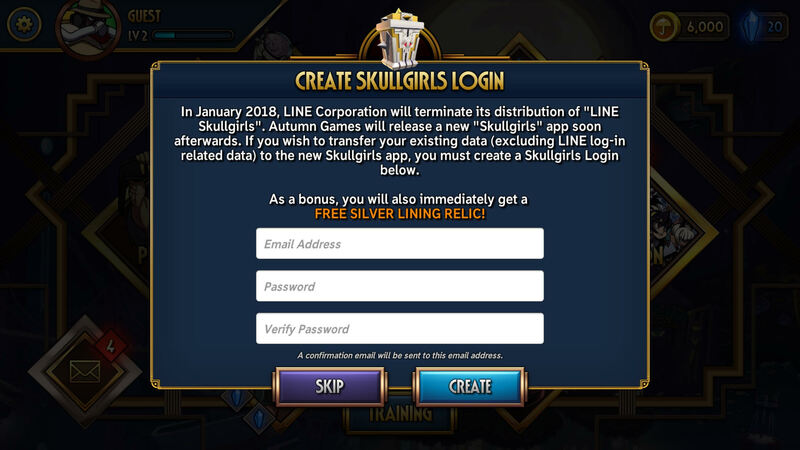 All you have to do to create a new Skullgirls Login is simply open the current Skullgirls App and log into your account using your current login method (Guest, Facebook, Google, or LINE) – it should do it automatically. Then you will be prompted to create a Skullgirls Login using an email and password, which will then be linked to the account you logged in with. You can also create a Skullgirls Login at any time while you are logged in by tapping the orange “Create Skullgirls Login” button on the Options menu. After completing this step, you’re good to go for the migration! In addition to keeping your progress, you’ll also receive a FREE SILVER LINING RELIC for your troubles! We recommend that you verify your Skullgirls Login email after linking your account just to make sure you have linked the correct email, but this step is technically unnecessary. LINE and Autumn Games have mutually decided to part ways. Up until now, LINE has been the publishing and distribution partner for Skullgirls Mobile, which also means they are responsible for publishing the app on the App Store / Google Play. You can read more about this in our FAQ. We have so many new and exciting features planned for 2018, and we’ll be sharing some of these plans very shortly after the new year on our official forums, stay tuned! If you would like to take a look at some of the changes we have in store for our new App in January, check out our early Skullgirls Mobile 2.0 patch notes on our forums. As always, a huge thank you to all of our players for joining us on this journey! We really can’t express how grateful we are to have such an amazing and helpful community. The feedback and suggestions we’ve received so far have been extremely helpful, and we can’t wait to show you all what we have in store for 2018.